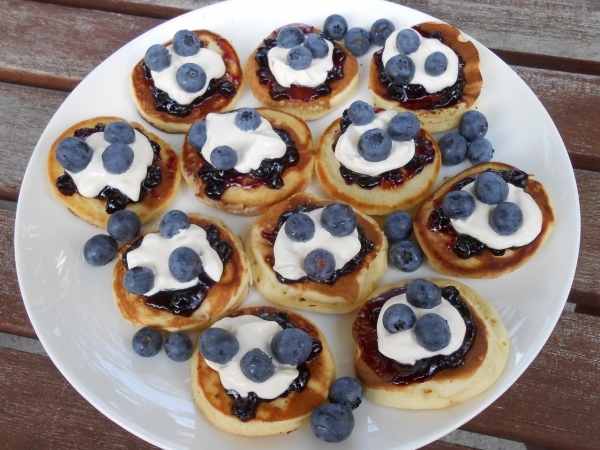 Make these on a cosy Sunday morning and enjoy them in bed! Whisk milk, egg and vanilla essence together. Sift flour and bicarbonate of soda into a separate bowl and stir in the castor sugar. Make a well in centre and pour in the milk mixture. Whisk until just combined then, add the blueberries. Heat a large non-stick frying pan over a medium heat. Add a little of the butter to the pan. Spoon 2 heaped tbsp. of the mixture into the pan and cook for 2–3 min. or until bubbles appear on surface. Flip and cook for a further 2 min. or until cooked through. Remove, cover with foil and set aside. Repeat with remaining mixture. Zest the lemon into the mascarpone, add the vanilla paste and stir through. Serve the crumpets piping hot with a scoop of lemon mascarpone and a drizzle of honey.